Between Glenridding and Patterdale next to Ullswater in the Lake District. This charming self catering cottage sleeps 2 people and well behaved pets are welcome. 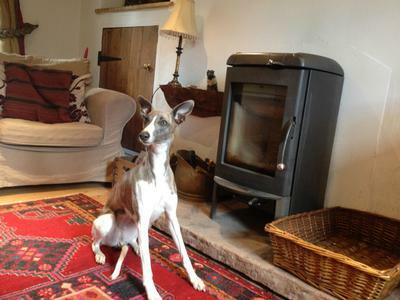 Character features, wood burning stove and garden.Ideal base for walking in the area. Holiday Cottage for 2 plus pet . Available for short breaks at times. Pets £5.00 each per booking, Max two pets. Welcome to Keeper’s cottage, near Ullswater in the heart of Cumbria and the Lake District. This wonderful character Lakeland stone cottage provides excellent self catering holiday accommodation for 2 people and one well behaved pet is welcome. This recently refurbished holiday cottage is located on the border of Glenridding and Patterdale, in the quiet of Grisedale Bridge. Perfect for couples and romantic breaks in the Lake District. Thanks. The traditional Lakeland stone holiday cottage sleeps two. It has recently been completely renovated and refurcished to a very high standard, whilst many character features have been retained, including beautiful beams, and stripped wooden flooring throughout with rugs. The front door opens into a living/dining kitchen with cosy wood burning stove and comfy seating. Upstairs there is a good double bedroom,king size bed & en-suite shower room. Outside there is a pretty garden and parking for one car. There are lovely views from the front of the cottage towards Place Fell and across towards Ullswater. 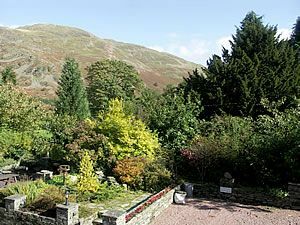 Our holiday cottage is located in Grisedale Bridge on the border between Glenridding and Patterdale,(10 mins walk to pubs and shops in either direction) which is situated in the centre of the Lake District. There are many things to do and places to see in and around the area. Please see the map links below for a selection. Ullswater, Englands most beautiful lake, is a short stroll from the cottage. No visit would be complete without a cruise on the famous Ullswater Steamers which run from Glenridding to Howtown and Pooley Bridge. The pier is just a 10 minute walk from our cottage. You can also hire boats and canoes at the Glenridding Sailing centre, and St Patrick’s Landing Boat hire, again less than 10 minutes away by foot. For those looking to enjoy the Lake District fells, the Keepers cottage lies at the foot of the Helvellyn range, with the majestic Helvellyn itself, and other great fells such as St Sunday Crag, Dollywaggon Pike and Catsycam. On the other side of ullswater is the less well known but equally beautiful Place Fell, and the old Roman Road of High street. Glenridding and Patterdale also have a good range of places to eat and drink, and there are a range of local shops, one with a cash machine, and a Post Office in nearby Patterdale. For more information on our pet friendly Lake District holiday cottage for two near Ullswater please contact us or visit our website using the links above. This wonderful pet friendly Lake District cottage for 2 is located on the border of Patterdale and Glenridding, within minutes of Ullswater. 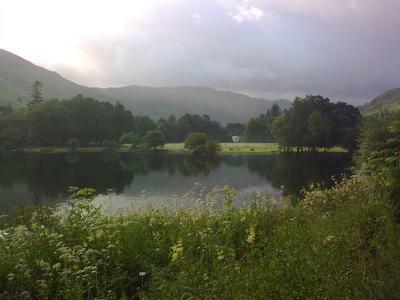 The ideal location for walking and exploring the Lakes, close to Helvellyn with views to Place Fell. Ideal! Contact james Sowerby for Enquiries and Availability.